Sure, brothers Eric Staal and Jordan Staal are in the spotlight right now with the Carolina Hurricanes and Pittsburgh Penguins, respectively, as the Eastern Conference Finals get under way Monday night. But the younger brother of Devils center Travis Zajac is making news of his own. Sure, it's not going to make headlines on TSN, but Nolan Zajac was recently made a first-round pick by the USHL's Cedar Rapids Roughriders. The 16-year-old defenseman was named MVP of the TELUS Cup, the Canadian national midget championship. "He's excited," said Travis of his brother. "There's camps coming up now, and hopefully he'll skate there (Cedar Rapids) next year." Of the four Zajac brothers, Nolan is the only defenseman. Darcy Zajac is a forward with the University of North Dakota. Kelly Zajac also plays up front for Union (N.Y.) College. So what was it like playing defenseman as the youngest of four? "He's a good young defenseman, the only defenseman in the family, so we beat up on him a little," said Zajac with a laugh. "He's probably tougher than all of us." 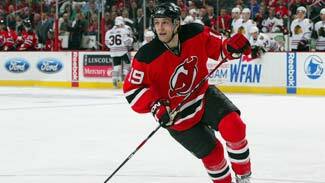 NEW YORK -- The postseason clearly ended too soon for New Jersey Devils center Travis Zajac. With a trip to the second round within its grasp, New Jersey allowed two goals in the final 80 seconds to the Hurricanes, giving Carolina one of the more improbable Game 7 victories in NHL history. Not that Zajac needed any reminding of that game. "The series was a battle. It went right down to the last two minutes of Game 7," said Zajac, looking as though someone was stabbing him with needles as he re-lived the nightmare during a visit to the NHL Powered By Reebok store in Manhattan. "We felt like we had control of that game for 58 minutes, but I guess that's why you play a 60-minute hockey game. "It's been a couple of heartaches the last couple seasons. You wish you were playing right now. It's sometimes tough to watch the teams you could've beat to be there." Losses don't get much more painful than that one, but the 24-year-old center is staying positive. Despite the gut-wrenching end to his season, Zajac is excited about watching the Stanley Cup Playoffs. He's seen first-hand the capabilities of Carolina, and he's plenty familiar with the prowess of the Pittsburgh Penguins. It's a series he can't wait to see. "They were two of the hottest teams going into the playoffs. They both have players with a lot of speed and can play the transition game," Zajac said. "The main thing is the goalies. (Cam) Ward's been playing great for Carolina, same with (Marc-Andre) Fleury. They're pretty evenly matched. "Pittsburgh might have a little more offensive punch, but it's the playoffs and anything can happen." Zajac spent two seasons at the University of North Dakota between 2004 and 2006 and played the 2005-06 season with Blackhawks captain Jonathan Toews. Zajac has watched his fellow Winnipeg, Manitoba, native grow by leaps and bounds during his brief time in the NHL. "He's a mature player for his age. Even in college, he carried himself like a pro." Zajac said. "He comes to work each day, he just wants to work hard. He plays with a lot of skill and a lot of speed and makes plays at high speed. For Chicago, he's been their leader and their go-to guy all season, which is great to see and I'm excited for him." "They were two of the hottest teams going into the playoffs. They both have players with a lot of speed and can play the transition game. The main thing is the goalies. (Cam) Ward's been playing great for Carolina, same with (Marc-Andre) Fleury. They're pretty evenly matched." Chances are, you're never going to get an NHL player to make a prediction about a playoff series, whether they are playing in it or not. But thanks to Toews and the Blackhawks, Zajac has a bit of a rooting interest in the Western Conference Finals between Detroit and Chicago. "It's two good teams, Chicago and Detroit, it's fun to watch. They're playing the defending Stanley Cup champs and they're that for a reason. It's going to be a tough series." Zajac hasn't been a couch potato since the Devils were eliminated by Carolina. He played for Team Canada at this year's World Championships. While he was held pointless in five games, Zajac enjoyed the experience of suiting up for his home country and coming away with a silver medal after a 2-1 loss to Russia in the gold-medal game. "It was a great experience to represent Team Canada, it was a dream come true," Zajac said. "It was a tough loss in the finals, but as a team we played well. It was a great group of guys. It was fun to be a part of."